Home Plant How to grow dragon fruit? India 12 September 2016: Dragon fruit plants are very easy to plant and maintain. But it takes years for it to bear fruits. The plant of the dragon fruit is type of a cactus. It was first planted in mexico. The dragon fruit is an exotic fruit with many health benefits. Let us see how we can grow dragon fruit. First of all you need decide how do you want to grow your dragon fruit plant whether from seed or from a cuttings of an already developing plant. The time to bear the fruit for dragon fruit plants grown from seeds is around two years but if you are using a cuttings from an already developing plant the time would be much lesser. Both these methods are pretty much simple it's just that bearing fruits from seeds takes more time. You can buy dragon fruit plants from professional growers and have them transplanted in your garden. Dragon fruit plant is a very easy to grow and grows quite well even in containers. If you decide to grow dragon fruit plant in a container, you need one that's 15" to a 24" in diameter, and at least 10"+ deep and fit in a climbing pole. However after a point of time you will need to transplant the plant to a bigger container. If you choose to plant outside openly or in container, choose a place that's at least partly sunny. The tips of the plant need to be in the sun to bloom. In winters if its very cold you can choose to bring the plant inside. To grow a dragon fruit plant you need to use well-drained, sandy cactus soil. Dragon fruit plants are light feeders that don't need a lot of nutrients. Plant them where water doesn't tend to pool in your garden. If you receive a lot of rainfall in your region and you plan to plant it openly then plant it on a hill so that the water doesn't wwe pool. If you are planting in a container, make sure there are many drainage holes at the bottom. You can make your own cactus soil by mixing sand, potting soil, and compost. If you're planning to use cuttings for growing a dragon fruit plant or a farm-ordered plant from a box, make sure you take it out carefully from its container and replant it flush with its new soil line. If you plan to use seeds, sprinkle a few into each container and cover the seeds lightly with soil. If you are using seeds it will take a few weeks time to sprout later then you need to separate them in different containers. Dragon fruit plants are slow growing plants, they also do not require much nutrients to grow. Even if planted from a cutting it will take up to four months to get a good, strong root system. Too much fertilizer can easily kill your plant. For best results, feed your dragon fruit plant a little slow-time release, low-nitrogen cactus fertilizer only about once every two months. 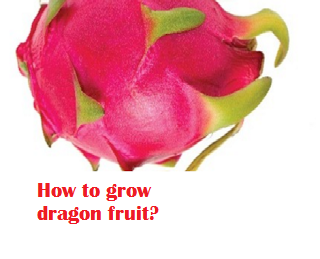 Dragon fruit plant doesn't require fertilizer to grow, if it gets adequate sun light it will grow very well. Dragon fruit plants like other cacti doesn't require a lot of water. Water the plant scarcely. Dragon Fruit Cactus must be treated like a Tropical Cactus and water when nearly dry but try to keep the climbing pole moist. An automatic dripper at the top of the pole works well. Over watering will kill the plant. Alsomake sure that the container you are using has enough drainage holes to remove any excess water. Dragon fruit plant will take two years to grow fully. Some plants can grow a foot tall in a week. When your tree starts growing and becomes big it will require a climbing pole to support it. The climbing pole will help it reach its full potential without it breaking or weighing itself down. The flower of the dragon fruit plant only blooms for one night and then whithers before dawn. Many of these flowers are self pollinating. Once the flower whithers and thebase of the flower starts to swell and the fruit starts to grow. Dragon fruit plants can grow quite big; some varieties of dragon fruit plant can also grow as tall as 20 feet. When it starts growing too big gets too, start pruning the plant by cutting off some of the branches. When you prune the plant it gets more stronger and concentrate the nutrients, and encourage the plant to flower. You can repot the pruned branches to have new dragon fruit trees shoot up. Once the fruit grows on the plant in most climates it should be ripe and ready to harvest anywhere between July to December. When the dragon fruit is ripe the outer skin is bright pink in color. Push in on the fruit with your finger. If it's soft like a ripe avocado then it's ready for harvest. After a long wait your dragon fruit is finally ready to be harveated and eaten. To eat the fruit you can cut the fruit into quarters and remove the outer coverinh and enjoy the sweet inner flesh or just using a spoon dig into the flesh and eat it. The fleah is sweet and has a texture which is similar to that of kiwifruit but it's a little crunchier. After your tree has fully grown and bourne it's first fruit you could see four to six fruit-bearing cycles per year. They will increase eventually; it just takes dragon fruit plants a little while to get there. You've waited patiently for years and now you shall be rewarded in abundance.